The iconic red chucks took the stage at the Lisner Auditorium at George Washington University on January 26th. 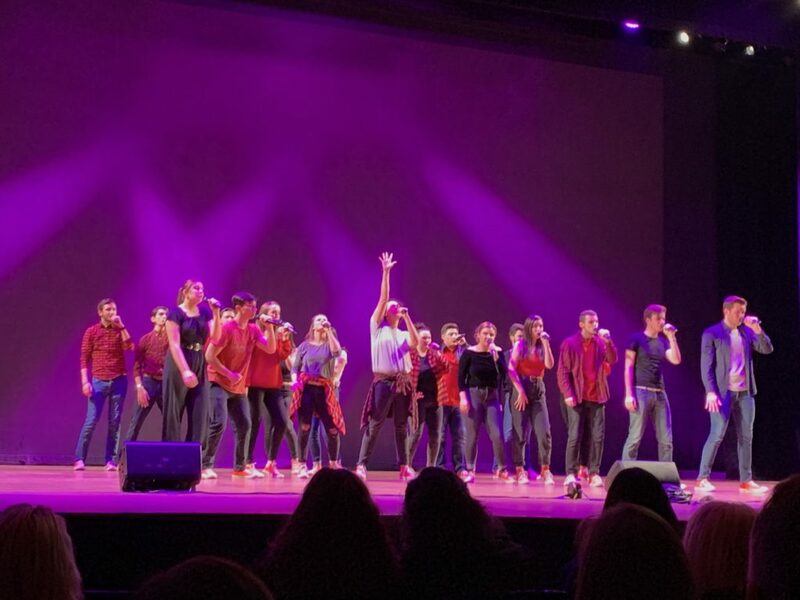 The Catholic University a cappella group competed for the mid-atlantic region title along with groups from George Mason University, Georgetown, Frostburg, and six other schools from across the DMV area. The ICCA’s are hosted by Varsity Vocals every year for collegiate a cappella. The performances were each tied to a 12-minute maximum for the set, to ensure a fair chance for each group to impress the judges. 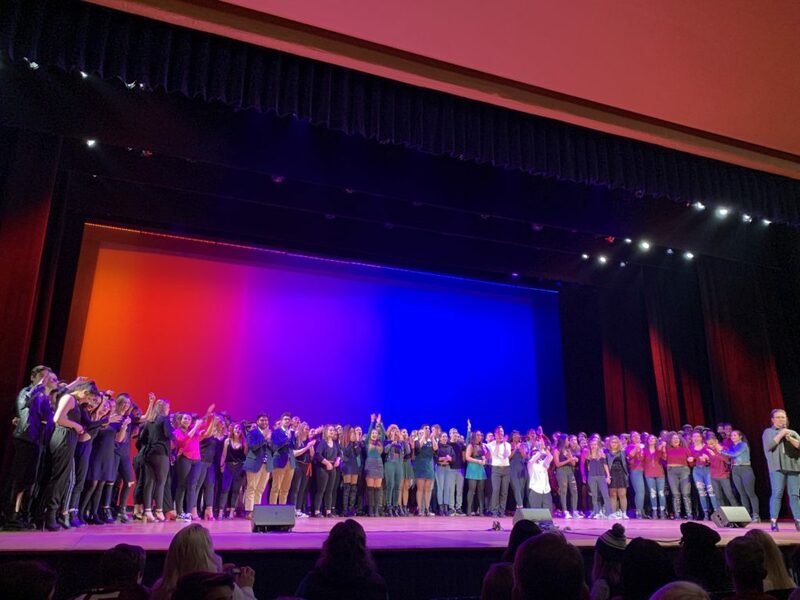 The first group to perform was an all-male group from James Madison University that excited the full-house with its soulful voices and choreographed dance moves. The entire auditorium was full of friends, family, and fans of the groups that performed. Dozens of students from Catholic University came to the event to support and cheer on their fellow classmates in Redline. Two all-girl groups also captivated the audience with their empowering message for women and their talent on the stage. Every performance brought unique aspects to the night in hopes of winning over the judges, and the night was full of smooth vocals and harmonies that gave the audience chills. Although Redline was the last to perform out of the ten groups, the group did not fail to capture everyone’s hearts and were a great closing to the night. Vincent was one of the soloists in the set and stole the audience’s heart with his visible passion for the performance and his stage presence. The group prepared months in advance for this event in order to ensure a successful performance. Students from Catholic University reflected that the group members’ love for one another and for singing shined through in their performance that was full of smiles and fun dances. The night concluded with the judges’ results for the performers. The GW Vibes took first place, Mason Some Noise stole second, followed by Note-oriety from James Madison University in third place. Awards were also given out to groups for outstanding soloists, vocal percussion, arrangement, and choreography. “We have such an amazing group this year and we closed out the competition strongly and got quite the applause. Our three-song set created a story for the audience and performing with everyone was something I couldn’t have imagined. I wouldn’t trade this group for the world,” said senior Frank Scalfaro, who has been a member of the group since his freshman year. Redline has now gone to the ICCA competition three years in a row. Based on the group’s performance last weekend, Catholic University students are anticipating its return to the championship next year in hopes of taking home a title.